Knit in the round with an unusual, yet easy stitch pattern this cowl is both lightweight and warm. Tucks into your coat without extra bulk. 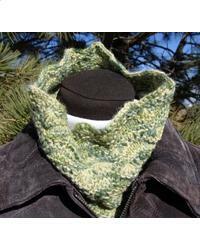 One of three patterns in "The Winter's Day Cowl Collection" by Desert Rose Designs.